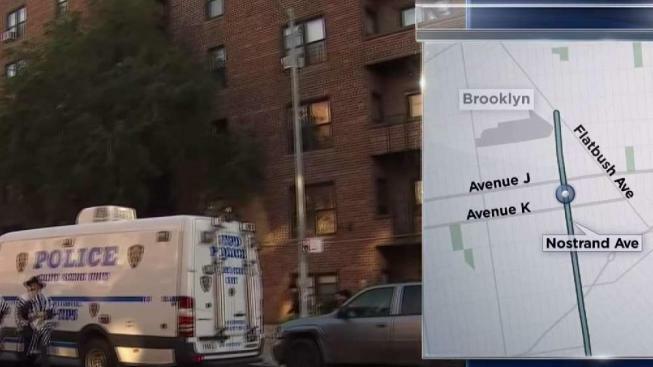 A 20-year-old man tossed his 4-year-old brother to his death from the boy's Brooklyn home, police said. Police responding to a 911 call found the little boy, Shimron Smith, unconscious and unresponsive in the courtyard outside his home in East Midwood around 3:30 a.m. on Saturday, the NYPD said. Shimron was pronounced dead at the scene, police said. The medical examiner said he died from multiple blunt force injuries and his death was a homicide. Shimron's brother, Shawn J. Smith, was charged with second-degree murder, the NYPD said. He's accused of throwing the boy off the roof of the seven-story apartment building on Nostrand Avenue, between Avenues J and K.
When asked by reporters if he meant to hurt his brother, Shawn responded “not really” with an apparent grin on his face. His family says Shawn had been here less than a year from Guyana. Shimron was the youngest of six siblings, his family said. The boy's aunt, Savon Firth, recalled "his playfulness -- he plays all the time -- his fun, his laughter. It’s so painful I cannot talk anymore. It wasn't immediately clear whether Shawn Smith had an attorney.